This is a very poor state of affairs on many levels. Firstly, I work almost within sight of the magnificent Pickles & Potter, with their stunning sandwiches and even better soups. They’ve even taken to turning up in the foyer of our building with big smiles and vats of the most incredible, rich, delicious soups. This ‘but I only keep a can of soup on hand for emergencies’ thing has to stop. Secondly, my kids seem to be gradually coming round to the idea of soup as an ‘acceptable’ thing to eat, although there are some boundaries (tomato for Lara, chicken for Ethan). Making soup from scratch is starting to make more sense, if the audience is willing. 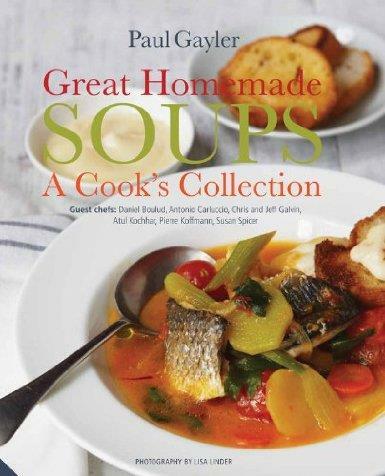 , is a perfect introduction to the dark art of making soup. And a dark art it most certainly is, but one that can be mastered with a little attention to detail and basics. I’ll say it now – STOCK. Making a good soup is all about the base ingredients, and in many, many cases, that means stock – chicken, beef, fish, vegetable. Get that right and you’re going to win. I had the misfortune to use a pork stock cube the other day, of the type touted around by a certain ex-bad boy über chef. It was revolting. Stock cubes do not make proper stock … they simply inject a massive dose of salt and MSG masquerading as something edible into your otherwise carefully prepared dish. It’s far better to make your own from simple base ingredients, and Gayler steps through exactly how to do just that. To me, this is the most important part of this book, and it’s right that stock making gets some attention here. Think of it as the foundations of a good meal … you wouldn’t build a house without some good, solid footings, would you? is divided up in a very no-nonsense way into sections on broths and consommes, smooth and creamy soups, hearty and wholesome soups, traditional favourites, ‘wild and exotic’ (read as basically South East Asian and Oriental), and chilled. I’ll skip the chilled section, because the chances of me ever making a chilled soup at home are precisely zero, given that I live in Yorkshire and the difference between our summers and winters is negligible in a good year … the real heart of this book is in the middle sections, a brisk jog through many of the classics you’d expect to see in a book of this type – a spiced carrot soup, a vine tomato veloute, a roast chicken soup (hurray! That’s both kids sorted out! ), a chowder or two and lots of great Italian soups. This, alongside a good range of slightly more adventurous and enticing recipes with ingredients like salt cod, chickpeas and chorizo. There’s a gumbo of roast duck, a light and delicate dish made from Belgian endive and blue cheese, a beautiful squash and lentil soup with dumplings made from bulghar wheat, and a lovely, fresh Cullen skink. The ‘wild and exotic’ section feels a little thin, a little tamed down perhaps, an it’s true that there are more authoritative sources of recipes for the glorious soups and broths from the East, but it serves as a useful introduction into many of the main groups of pan-Asian soups, and there are techniques to be learned and flavours to be sampled. Think of this as a starter chapter, and in that sense, it works well. There are a few recipes here from other chefs, including Tom Kerridge, Antonio Carluccio and Pierre Koffmann, which help to give the tone of the book some variety. This is a well-balanced and broad collection of recipes. There’s a clear emphasis on doing things properly, on getting the basics right first, and building up a good repertoire of recipes. It’s a very good introduction into an often overlooked area of cooking.